Though much of the procedures involved in Q methodology can be accomplished using a variety of programs and tools, some special purpose programs offer extra features widely used by Q researchers. PQMethod, maintained by Peter Schmolck, based on FORTRAN code by John Atkinson at Kent State University. Free software (GNU GPL), available for Windows, Linux and (via DOS-emulator) for OS X.
PCQ, developed by Mike Stricklin. Proprietary software, available only for Windows. qmethod package for the R software environment, created by Aiora Zabala with contributions by Maximilian Held. KenQ Analysis a web application for Q methodology, free analysis software developed by Shawn Banasick. Runs in supported browsers (Firefox, Chrome, Edge). Free software, available on a wide variety of UNIX platforms (including Linux), Windows and OS X.
qfactor, a program in Stata that performs factor analysis based on different factor extraction methods and rotates factors based on almost all factor rotation techniques (orthogonal and oblique). qfactor is also able to handle bipolar factors and identify distinguishing statements based on Cohen’s effect size (d). For further information contact Noori Akhtar-Danesh. Accompanied by qconvert, a program written in Stata that coverts a raw Q-sort data file into a new Q-sort data file which is ready for analysis by qfactor program. Like QMethod Norman Van Tubergen’s QUANAL is a FORTAN program, developed in the 1960s for mainframe platforms. It is rather complex, and offers a great variety of features and options with respect to input-data structure, methods of analysis and the presentation of results. For further information contact Norm Van Tubergen. HtmlQ Aproxima Open Source (MIT) Web: HTML5 Modern HTML5-port of FlashQ, backwards compatible. Q-Assessor Stan Kaufman / Epimetrics Group LLC. Proprietary Web Includes analysis. Not accepting new projects at present. Also consider other Q studies that have been conducted online. 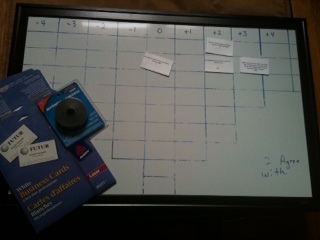 Also consider this design by Gaylene Halter of a Q Sort Board made out of business cards, magnetic board and tape.